69... Anyway up, Meal for Two, A Favourite of mine. Yesterday evening saw 15 Saddleworth Runners gather for the 6.45pm Pete Hartley Memorial.Liver Hill fell race from Rawtenstall’s Marl Pits Sports Centre in the hills of Lancashire. 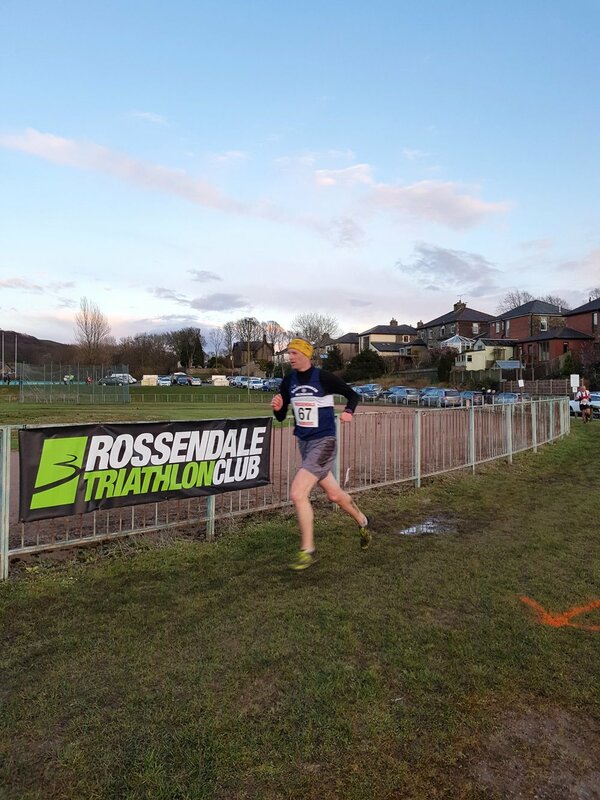 A great race put on by Rossendale Harriers. I also learnt something about Bingo nicknames, for my 69 race number. Snigger, snigger, and look it up. Your author and editor wearing his dubious race number. The race is classified as an BS (with no GPS), and to the uninitiated a fell race is classified in hardness from C to A, and whether short, medium, or long. Category “B” should average not less than 25 metres climb per kilometre, and should not have more than 30% of the race distance on road. A category “S” (short) race is 10 kilometres or less. Richard “Gee Man” Gee picked myself up from Top Mossley (never call it upper) and had just picked up Ruth Hutchison aka “Smiler” from Bottom Mossley (never call it lower). And thus we were off to beat the traffic with it being an early evening start after work. It was nice not to be driving for a change. I think Gee Man and Smiler liked my excited banter. We arrived at the sports centre and the first impression was the cold, despite it having been sunny earlier and en route, but there had also been hailstone and the temperature was probably around 4/6 degrees C. We registered and saw other SADDS gathering for what would be a Club Championship race and local Run The Moors race. It was going to be an interesting one. On the drive over we had mulled over just how many of us would be out. Smiler went for 10, me 12, Gee Man 15. It was after all an after work race. Gee Man won with 15 of us; it was going to be a hard fought race. Editor’s amendment: Gee Man pointed out that Smiler said 15 Sadds, he 10, the Editor 12. So 1-0 to the girls. Missing Messrs Brandon Greene and Tony Greene Snr. 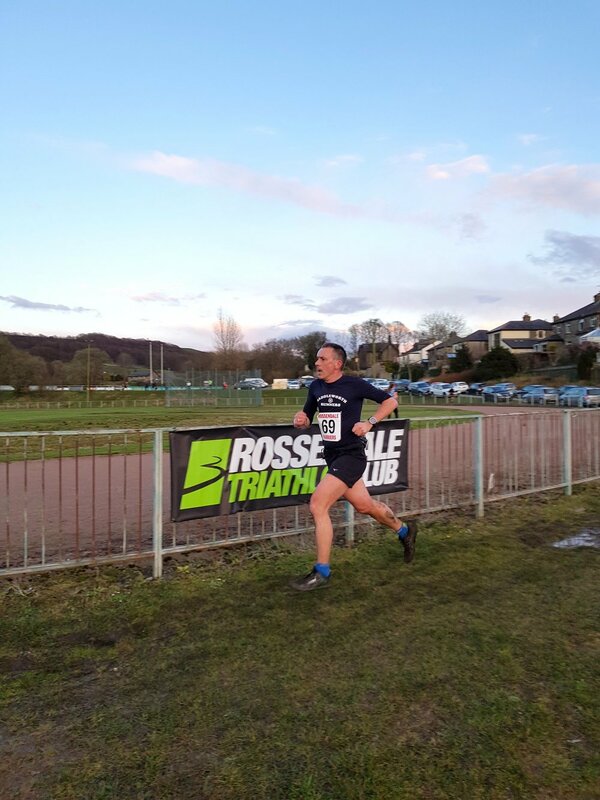 The race organiser explained in fact that there were 268 runners, and on the race line it felt more like a cross country race than a fell race. The race is fast with total distance being 5 miles, 800 feet climb, and importantly it is an “in and out” to the Liver Hill summit. The pack ran fast to the first small climb with more than one bottleneck after that along muddy paths. It was accidental elbows galore, much to the amusement of Bridget Lancashire aka “Bob” who was chortling along. I was glad we’d trotted up earlier to look at the start and I was able to take a couple of short cuts. You then climb up steadily to Bonfire Hill heading for Swinshaw Moor, with the route dropping down over very runnable grass and bog. You then climb to Liver Hill along the route coming across some rock from disused dry stone walls making it a bit tricky underfoot. It was eyeballs out to the turn at the summit, somehow on the way up I had passed The Bullet and was chasing Gee Man, who saw me at the turn and then proceeded to “do one”. Surprisingly the route back after dropping off the summit climbs back up to Bonfire Hill, but your mind was taken off this and burning legs whilst dodging fellow runners as you passed them on the way down. On slightly tired legs from a long one on Sunday, Gee Man was chased down but to no avail. He’s running well and deserved to come in before me and not long after The Gopher who had belted off earlier. I was thankful to have The Bullet (Kevin) up my arse and this pushed me to fast times on the way down to the finish. The last 1.5 miles are fast but you were rewarded with wonderful views in a dusk sunlight over Rawtenstall. On finishing I had to bend over double to get the breath back, before seeing the others come in and getting some much needed water. By now the sun had disappeared and the temperature had dropped to 4 degrees C. People decided to move on and head to the cars to change into warm gear for the journey home. A truly small, simple, sound race. Newer PostThe many names of the "green thing".